Last week I attended the Education Innovation Summit at Arizona State University SkySong, which was organized for the second year by Michael Moe and Deborah Quazzo. The conference was unusual for its intimate size and the access to “top-down” influencers and “bottom-up” innovators — technologists, educators, authors, CEOs, and politicos — that Moe and Quazzo brought together for this two-and-a-half day meeting. For growth companies and funders, the meeting was a mechanism for speeding the capital process and gaining traction for new ideas. Those committed to system reform heard from speakers, including F. Philip Handy, member of The Aspen Institute’s Commission on No Child Left Behind, who addressed the very significant political and infrastructure challenges that continue to obstruct more progressive technology adoption in mainstream education. Everyone grappled with what needs to happen next, the common refrain being that incrementalism will not be enough to get our students and system from here to where it needs to be, and quickly. In a candid and entertaining closing session, Marguerite Kondracke interviewed Joel Klein about his departure from the New York City Department of Education, where he was Chancellor until 2010, and his plans and priorities as Executive Vice President of Rupert Murdoch’s News Corporation. The shift print to digital: dynamic and interactive instructional content is coming fast. Data driven system: with digital learning and more instant feedback, we can try a dozen lessons and see what works best, test empirically whether fractions should come before decimals or whether it matters whether physics comes before biology. Klein thought Wireless Generation (a News Corp company) was well positioned in this regard. The shift from classroom-centric to device-centric learning unbound by time and place. Customization by level and approach. Human capital: the ability to focus on the value-added and really inspirational part of learning, and not asking every one to do the same stuff (like build lesson plans). 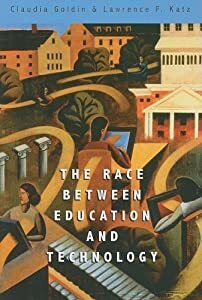 Joel mentioned “The Race Between Education and Technology,” by Katz and Goldin, and “Special Interest,” Terry Moe’s new book, as two important reads. He thought they illustrated why we need to be disruptive — because the future won’t be kind. In a keynote a day earlier, Michael Crow, President of Arizona State University, described the dramatic changes he is making to reinvent the state’s higher education system. “Tradition is the enemy,” said Crow — it threatens our educational outcomes, knowledge base, and global competitiveness. The system as it exists today centers on faculty, not students, and this needs to change dramatically, not incrementally. Why hold on to constructs and systems that are no longer practical or relevant, which gate progress, performance, and success? Crow’s vision calls for a scalable, student-at-the-center system with top-level researchers investing more time in the classroom as master teachers. His goal is not only to overturn the status quo but to transform Scottsdale and the region as a hub for business and research innovation in the model of Silicon Valley. Since 2002, Crow has also lead the establishment of major interdisciplinary research initiatives: the Biodesign Institute; the Global Institute for Sustainability; and MacroTechnology Works, a program integrating science and technology for large-scale applications, including the Flexible Display Center, a cooperative agreement with the U.S. Army. Despite lower pay and more classroom time, Crow says that the faculty members are advocates — true believers. Many of his recruits are leading researchers from name institutions who forsake the “safety” of the ivory tower to be part of a high-stakes movement to reinvent higher education for the next century. In addition to keynotes and concurrent sessions there were opportunities for growth companies to meet with capital investors and present their products during “speed dating” presentations. Many of these centered on un-packaging textbooks and delivering self-paced, virtual learning experiences (VLEs) with in-built performance assessment capabilities — using tools that ranged from serious games to open source apps (see Kahn Academy). A few large publishers (Pearson, Cengage, Scholastic) were on hand, but start-ups dominated the innovation conversation. Most of us, once strictly publishers or educators, are now in the media business. The good news is that the global education media market is poised to launch in new directions — with ideas, technologies, and devices in abundance and tech-savvy students clamoring to engage with knowledge in new ways. The bad news is that in the U.S. we are facing a national education crisis in which: a) our students are falling further behind their counterparts in industrialized nations (see OECD’s 2009 PISA Study and a summary in December’s New York Times ); b) our public education system is too dysfunctional and entrenched to respond with agility; and c) success equating with the kind of disruption at scale that systems like education are designed to prevent. It will take even more than entrepreneurship and private sector dollars to generate meaningful improvement. Political and systemic barriers will need to be challenged from the top-down while, at ground level, investments are made to advance learning technologies and drive demand for better educational options and outcomes. 2 Thoughts on "Top-Down and Bottom-Up: The Squeeze That Can Revolutionize (and Save) American Education"
Are students really “clamoring to engage with knowledge in new ways”? Here is what a friend recently told me based on her observations of her friends and their children who are now in college: “the kids don’t study. I suspect they rarely go to class. Some of them are flunking out, but their parents are still paying the bills. I’m aghast at the behavior of the kids and their parents, and these are my friends! I can only imagine that it’s like this for most kids everywhere, and if that’s the case, it is depressing indeed. They are partying far more than they are studying. College for most of them is a big joke.” On Michael Cole, while he is certainly innovative, not all of his ideas work out–Fathom, his online learning experiment at Columbia, failed miserably. Sounds just like when I was in college in the late 1960’s, so I doubt things have changed much, or ever will, nor are they any worse. Learning is not the student’s highest priority at that age, nor should it be. Life is not a job. As for clamoring for new technology, that is great hype when you are looking for investors. Learning is hard, grinding work, and it probably always will be. Technology can help a bit, but I see no revolution in the making. In fact I have been studying science education for four years and have concluded that it is basically just fine. Of course there is always room for improvement and we have lots as it is, every year, everywhere, much of it technological. So the idea that there is some fundamentally different way of teaching and learning, that we should jump on with both feet, is just wrong. The very idea that simple improvement should be called “reform” is a measure of the mania. (It is also insulting to the teachers.) Any technology that is predicated on disrupting the education system is doomed to fail. There are lots of specific needs and markets, but they depend on working with the system, not against it. The Kitchen Remodel -- Which Sites Should Inspire Us?